This is Celeste Turner Wright Hall, a colourfully painted building on the UC Davis campus, home to the Main Theatre and to the Department of Theatre and Dance. Yes, that’s spelled “Theatre” not “Theater”. This building was named after Celeste Turner Wright, who was the first tenured female faculty member at UC Davis. She was also the first drama instructor on campus; you can find out more about her long and illustrious career here. This building was built in the 1960s and was famously photographed by Ansel Adams. In front there are a couple of Robert Arneson’s Eggheads called “Yin and Yang”. I sketched it last week at lunchtime, furiously drawing as much as possible. but added most of the colour later. Oh, click on the image if you want to see it larger. Hey I thought you might like to see this, the first time I ever sketched it, which was back in November 2006. I remember doing this and loving playing with all the paint, still actually one of my favourite Davis sketches, mostly because it’s so different from what I do now, but also it was still that first year here, still discovering everything. 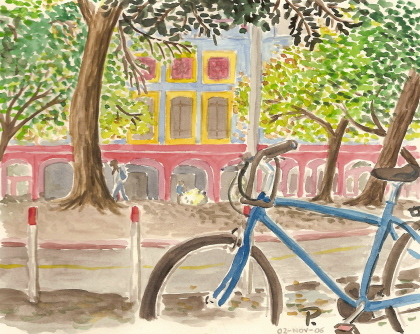 Looking back, it really took me a lot of time to settle in, even though I worked both on campus and downtown and explored whenever I could, riding around on my bike in the stupid, ridiculous heat. Well, I’m still here, still exploring. 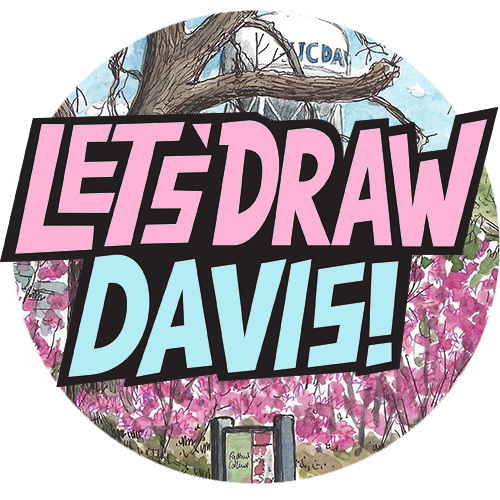 Are you still discovering new things about Davis after all these years? Love your drawings! Can I ask what media you use? Is it ink and watercolor? Thanks! I use a dark brown pen (uniball signo um-151 is the type) and watercolours to colour it in.